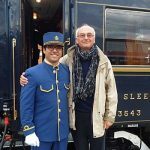 There are some things that you just have to do in your lifetime and one must surely be to travel on the Venice Simplon-Orient-Express. The setting for one of Agatha Christies greatest books ‘Murder on the Orient Express’, it is a chance to step back in time to the 1920’s and 30’s and steep yourself in ultimate luxury if only for a few hours. Travelling between Venice and London, this is the ultimate in train journeys. Stepping aboard this wonderful train you will immediately be immersed in a bygone age when trains such as this just oozed quality and service. Leaving Venice mid-morning, I was picked up by private water taxi and soon settled into my cabin with a drink. Ahead of me a 36 hour journey which would take in Italy, Austria, Switzerland, Liechtenstein, France and finally the UK. With engine changes at each border, there was plenty to see and take in on this journey of a lifetime. Leaning out of the window when we stopped for engine changes, it was interesting to pass the time of day with the locals who were fascinated by the train and its passengers. 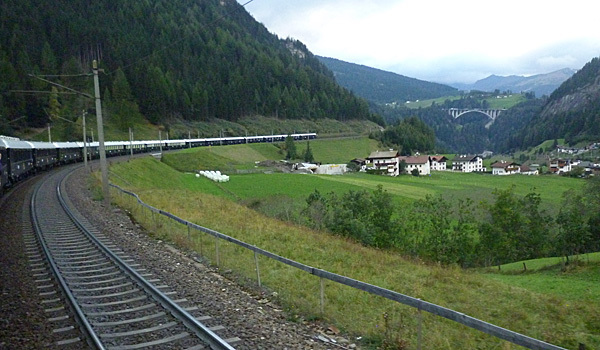 The train starts off from Venice by crossing the bridge across the Venetian Lagoon and then making its way through the vineyards of northern Italy to the famous Brenner Pass. The scenery in this area is quite magnificent and climbing up to the pass the temperature drops significantly so it was good to be cosy and comfortable as each carriage comes with its own original boiler stoked by your attendant throughout the day and night. I travelled in October when it was still sunny and warm but high in the Alps the temperature drops quickly. 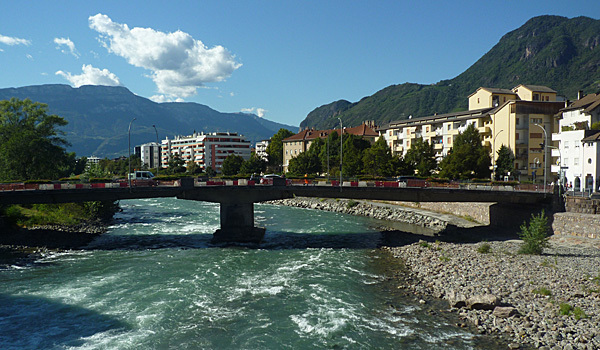 From the Brenner Pass the train passes through Austria stopping briefly in Innsbruck where passengers can get off and stretch their legs. From the end of the platform there is a good view of the Olympic Ski Jump. During the night the train also passes through Lichtenstein, Switzerland and France. 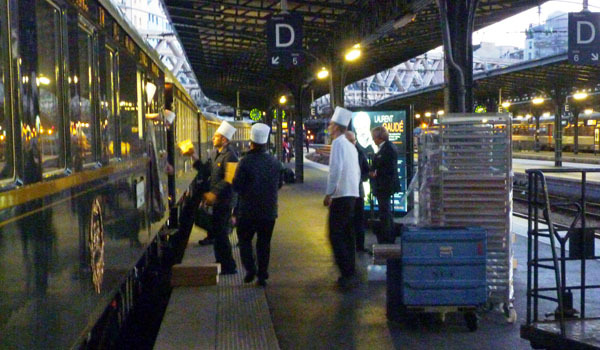 Its second stop to take on supplies is in Paris at the Gare de L’Est. The train I was on stopped around 8 a.m. giving us time to walk along the platform. Travelling on from Paris, it then makes its way across Northern France to the port of Calais where you leave the train at a small station in the town. 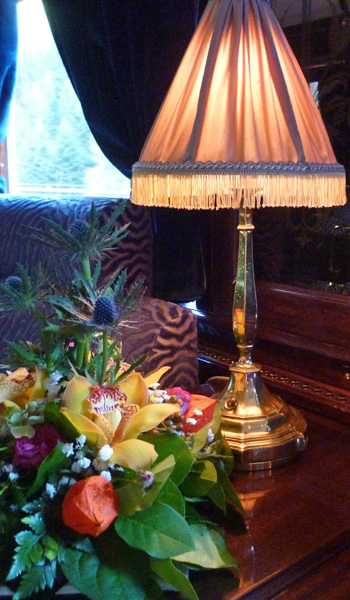 A luxury coach now takes you through the Channel Tunnel to Folkestone where you then board the Belmond British Pullman. This train then winds through the delightful Kent countryside enjoying afternoon tea arriving in London at Victoria station in the early evening. 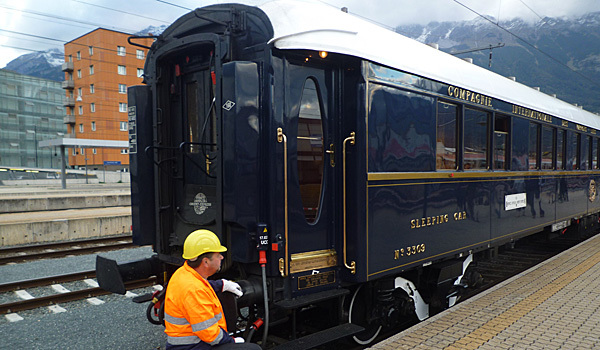 Travelling on the Venice Simplon-Orient-Express is an amazing experience. 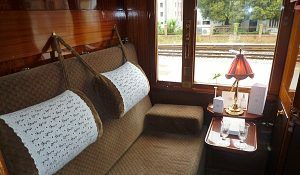 Everyone has their own private cabin which converts at night into a lower and upper berth. This is very cleverly arranged so that everything takes place whilst you are at dinner. Cabins have their own washbasins, towels, dressing gowns and slippers. However the toilets, which are quite amazing, are at the ends of the carriage. I had a cabin quite close to the rear of the train which meant that it was very near to the toilet with no through traffic! As the excellent attendant explained — you have to remember that you are on a train and that this is an experience. The sleeping cars which are beautifully appointed are very comfortable. Meals are taken in one of the three restaurant cars except for the continental breakfast which is brought to your cabin. There is also a very luxurious bar with its own grand piano and sumptuous seating. You will also find a small shop on-board the train where you can purchase a range of gifts. Do take time to talk to the guy behind the counter who has a fascinating connection with the train. Your main luggage goes in a special compartment in the train and so you will need to pack a small bag for your overnight stay. Also remember to leave out any dresses or suits you might want to wear for the evening. You are expected to dress smartly on board which is all part of the experience. Once you leave the train at Calais you can hand over your entire luggage which is taken separately by road to London where you will find it on the platform when you arrive. Considering the cramped conditions, the food on-board is just amazing and of a Michelin star standard. Remember however to tell them of any allergies or dislikes before you board. Paolo Bertipaglia the Maître d’Hôtel comes round to your cabin at the start of the journey and lets you know the time of your meal and the restaurant you will be in. All three are unique and quite superb and it is a good idea to ask for a different one for each meal. From experience I would suggest you opt for the later sitting and then go along to the bar beforehand for a cocktail as it can get very busy later on. The prices on board are not cheap but then you should think of this as a once in a lifetime experience. You can also order your wine or champagne for the meal. Lunch was the first meal after boarding in Venice followed by a four course dinner. The next morning there is a continental breakfast in your cabin and then brunch which takes place late morning. Once on-board the British Pullman you will be served a typical English afternoon tea with sparkling wine. Drinks are also served on the coach and you can request tea and coffee in your cabin when you wish. 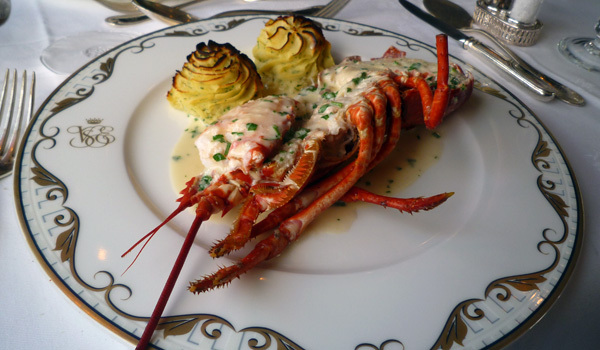 One of the signature dishes served for brunch is lobster. The Executive Chef Christian Bodiguel is a very charismatic character and if he has time, do try to talk to him. There are tables for two and four people. All of the staff are extremely friendly and happy to talk at length. Travelling on the train provides a chance to dress in style and many of the guests dress up in 1930’s style dresses and tuxedos. Nightlife on the train is concentrated in the bar. On my journey I was told that people were up until 4 a.m. singing around the grand piano! After dinner, guests tend to return to their cabins or go to the bar. The whole experience depends on what you want. Some people go on the train to celebrate an event whilst others like to use it as a time to socialise. 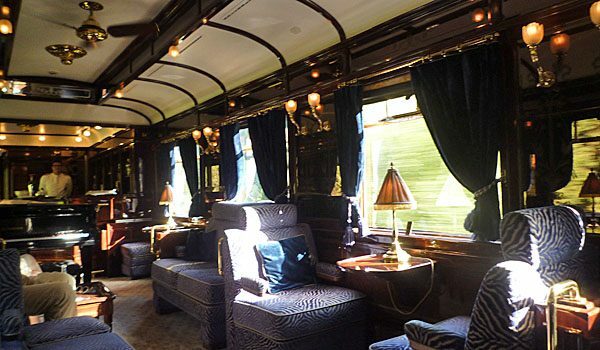 Travelling through the night on one of the most luxurious trains in the world is an experience that is just wonderful and so it is very important that you embrace every moment. The train comprises of authentic art deco restored carriages which are pulled by different locomotives during its journey. You should therefore be prepared for several stops on the way. As it is so special the train tends to draw attention and you will find people taking photographs as you pass by. You can travel on it from Venice to London or vice versa. It is also possible to book sections of the journey. If you want to avoid the coach transfer then you could always travel to Paris from London on the Eurostar and then join it at the Gare de L’Est. Eurostar comes into the Gare du Nord so you will need to make a transfer across the city. You can also travel on the train from London to Paris if you so wish. 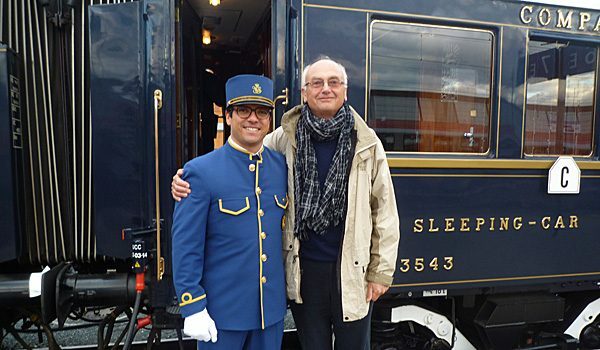 Travelling on the Venice Simplon-Orient-Express does not come cheap but it is an experience of a lifetime. Further deals on the service can be found at www.belmond.co.uk.